The etiology of acne is still not known for sure. It is believed that there are four critical factors and that one of them is appearance of microorganisms. At the time of puberty, sebaceous glands are activated and the skin becomes oily and more suitable for the growth of microorganisms. It is especially important appearance of lipophilic bacteria Propionbacterium acnes. Propionbacterium acnes is located in the sebaceous glands and on the skin surface, but never in the dermis. This bacteria release a series of enzymes, proteolytic, lipolytic and saccharolytic. As a result of action of these enzymes degradation product occurs, which diffuse from sebaceous glands to dermis and there cause an inflammation. These degradation products cause chemotaxis of various leukocytes, mostly neutrophils and activate the immune system. On the surface of the skin this manifests as an inflammation. The number of bacteria is proportional to the amount of sebum, so the aim in acne treatment is to reduce the number of present bacteria and to reduce sebum production. 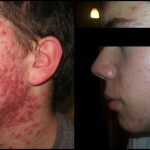 This effect is achieved by the application of laser in the acne treatment. Laser for acne directly affects sebaceous glands in the skin due to the combination of light and optical energy and energy of bipolar radio waves. The spectrum of blue light has a direct impact on Propionbacterium acnes in the sebaceous gland ducts. Photodynamic reaction occur between the blue light and fotoporphyrin which are an integral part of the bacterial membrane (photosensitive molecule), which results in oxidation and release of free radicals that cause cell membrane damage and the complete destruction of bacteria. The number of Propionbacterium acnes reduces and stops the process of inflammation in sebaceous glands. The red and infrared part of the light spectrum and also bipolar radio waves have thermal effect on the deeper parts sebaceous gland, which results in reduced production of sebum. DOES THE ACNE TREATMENT HURT? Each person has a specific, different reaction, his own related experience of treatment, which lasts from 5 to 30 minutes depending on the size of the area to be treated. The majority finds that the treatment is quite nice, even though a slight uncomfortable sensation is common. HOW MANY TREATMENTS DO I NEED AND WHEN I SEE FIRST RESULTS? Laser therapy acne treatment is a safe and effective treatment that is conducted in a series of two treatments in a week during 5 to 6 weeks. Results are individual because there are always customers who react faster or slower, but most of them see improvement after only 4 treatments – after two weeks of treatment. DO I NEED AN ADDITIONAL TREATMENT? We treat already existing acne with laser, but genetic and environmental factors can cause the appearance of new acnes and sometimes it is necessary to have additional treatments after the first series. 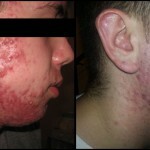 WHAT TYPES OF ACNE CAN BE TREATED BY LASER? Indications for laser are comedones, papule, pustule and cystic acne.